I pack Vance's lunch everyday for school and I'm tired of spending money on baggies that get thrown away. Viola! 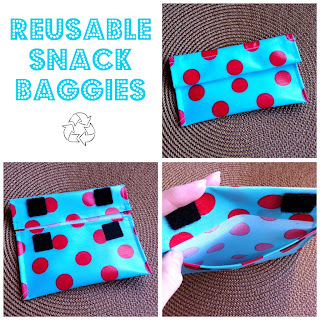 Reusable Snack Baggies were born. And as a added plus they're earth friendly. A twofer. I purchased laminated cotton fabric online that is BPA free. I cut it to size, sewed a few straight lines, stuck on hook and loop squares and was in business. Seriously, I don't even think it took 10 minutes to make. Perfect. The design is pretty simple, but it serves the purpose that it's intended for. Come on, I send them to school with Vance everyday so there's a chance that accidentally he'll throw them away. For that reason alone they don't need to be too fancy! For washing, simply wipe them out or use soap and water and air dry. I have a ton of fabric left over and soon will be up to my ears in reusable baggies. That's not a bad thing, right? I hear Teacher Appreciation Day is near, guess these could work for that. Would be great for keeping small things organized in your purse or desk! Oh! Want to get my posts via email? Just put your email in over there where it says "Follow by Email" and whenever I update it will go straight to your your inbox. Like magic, right??? This is a great idea. Where did you get the laminated fabric from? Thanks! I ordered the fabric from Harts Fabric. What a great idea! I don't have to make lunches yet, but I know I will be needing those soon. I may have to commission you to make some for me. I have no idea where my sewing machine is right now, plus I know I have never taken it out of the box and I have zero time. Your stuff always looks great! Sarah, I'll make you some - no biggie! You have enough going on right now! Thank you so much. I will pay you for them!!! genius!! i need to make these now. i hate those baggies.